Every year I get a little nostalgic around October. I miss the change of the season, cheap the way the air becomes clean and chilly, steroids the turning of the leaves and the faint smell of firewood. But soon enough, I start hearing about Nor’easters and the dreaded “Wintry Mix” and all my nostalgia goes away because it’s bright and sunny and 70 degrees out. Even if we don’t get Fall in Miami, we do get Fall ingredients. There’s nothing I love more than winter squashes and apples and dried fruit. So this weekend, I got my Fall on by making Pumpkin Apple Chutney for my lamb chops. It was sweet and spicy, but had a nice bite of lime, red onion and jalapeÃ±o. I also added some sweetened tart cherries and fresh mint. A great way to incorporate Fall into my life, even while I ate on my balcony in shorts and flip flops. Start by making the chutney. Place a pot or large saucepan over medium heat. Once it’s hot, heat the olive oil, then add the onions and saute for about 5 – 7 minutes or until they begin to turn translucent. Add all the remaining ingredients except the mint and cover. Simmer for 20 minutes, then remove from heat and stir in the mint. Transfer to a jar or container, then let cool to room temperature before using. I actually like to refrigerate mine for at least an hour, but that’s really a preference. When your chutney’s ready, prepare your chops. Set a large skillet over medium heat. Once it’s hot, heat the canola oil and sprinkle your chops with salt and pepper on both sides. Place them in the skillet, leaving plenty of room around each chop. Sear them for about 3 – 5 minutes on each side, depending on their thickness. They’re done when they have a nice char on the outside and the inside is about 150° on the inside. Remove from heat and let sit for about 5 minutes before eating. Serve the chops with some chutney and sprinkle the top with mint leaves (optional). Makes about 3 cups of chutney, which is more than enough. Refrigerate leftovers in an airtight container. It will keep for a few weeks. The lamb is enough for 2. Add 2 chops for each additional guest. You should have enough chutney for about 12 guests. This looks like the perfect fall meal! I can’t wait to try it! This really looks delicious, I love how you incorporated your Miami flare in there! What would you serve on the side? Thanks and I enjoyed reading your post (I’m a Bostonian :D). lamb chops and pumpkin. wow! this looks so delicious! 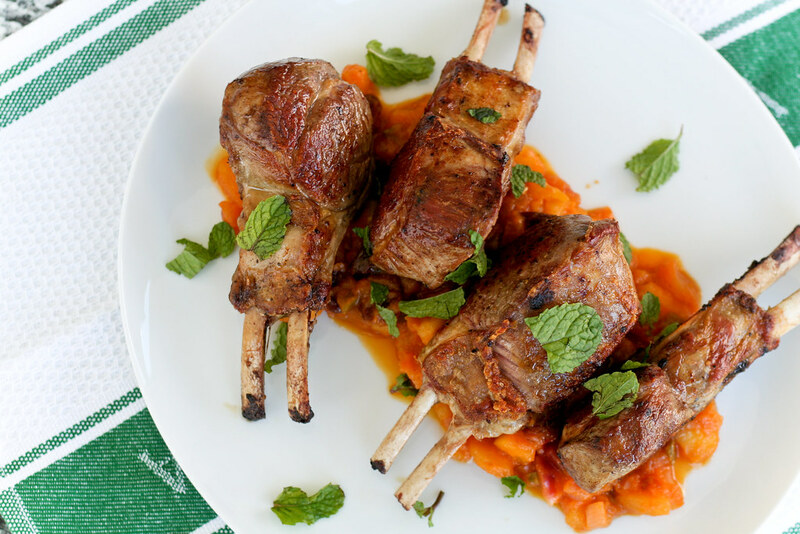 This looks amazing and the flavors are so unique…I love lamb and pumpkin! Paula – I served it with a scallion and almond rice pilaf. Where in New England did you live, Mel? Samantha – I lived in Boston for 4 years while I was in school. I love New England and still have lots of friends there. One of them owns a hotel in Old Orchard Beach, ME and we visit every year. It’s a beautiful state! Ok, this is possibly a really stupid question, but don’t lamb chops normally only have one bone? Did you just french them, making what normally looks like just one bone into what is actually two separate bones? Or did you ask your butcher for a particular kind of lamb chop? I really like the way these look, and I would feel like such an idiot asking a butcher, “hey, could I get some lamb chops with, you know, the two bones sticking out of them…” Thanks for helping me save face :) And the pumpkin apple chutney looks amazing! Megan – These are exactly how they were in the Whole Foods case. I think they’d have been too thin if they had just the one bone, but it wasn’t a special request. I wouldn’t feel embarrassed about asking the butcher though – that’s their job! Overall: amazing! The jalapeno gave the chutney a nice bite. I made a couple of mistakes along the way. First time round, I burnt the onions while they were being sautÃ©ed on their own. Not sure what I did wrong: either didn’t add enough olive oil, didn’t stir them around enough, or chopped them too finely. Also, I added too much water to the simmering pot, making my chutney come out a little watery. Refrigerating it helped address this. Chilled chutney was a great touch! I served mine over brown rice. Lastly, on the one bone or two bone question, I think different butchers cut them different ways. Mine were single bone, which means you have to adjust the cooking time. I did 4 minutes and 2.5 minutes to get them medium rare. Lamb is my favorite meat. 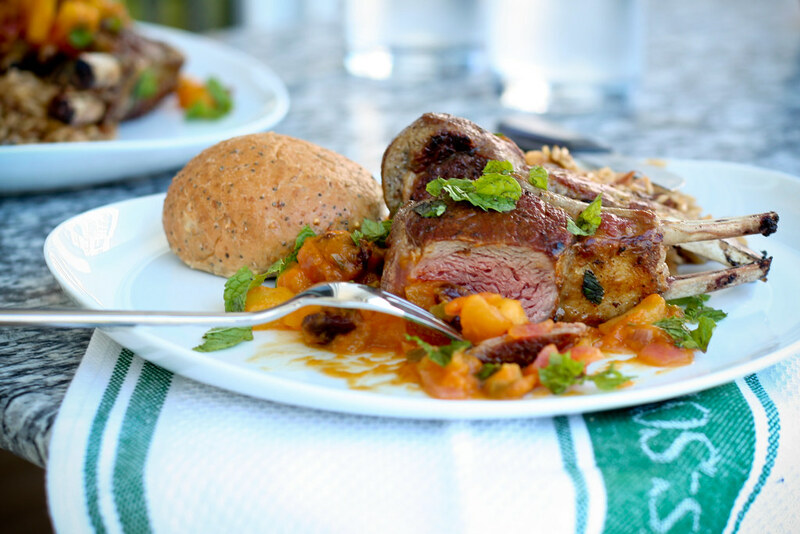 I’m so glad to see so many lamb recipes on your blog. Good lamb is hard to find unless I drive to Metro Atlanta area, so, for now, I have all the ingredients to make the chutney and will serve it with pork chops tomorrow evening. I will totally be trying this one! Looks fabulous. I don’t even know how I ended up here, however I believed this publish used to be great.